The spacious house consists of living room, bedroom, kitchen, shower / WC and a small hallway. The rustic-style living room has a sofa, dining table, games, books, radio and TV. Upstairs of the house is the bedroom, with double bed (180x200, separate mattresses) and cot (wood, 80x140), which is only accessible via a steep staircase. The fully equipped kitchen has a seating area for 2, a fridge-freezer, ceramic hob, oven, dishwasher and microwave. Dish towels are provided. 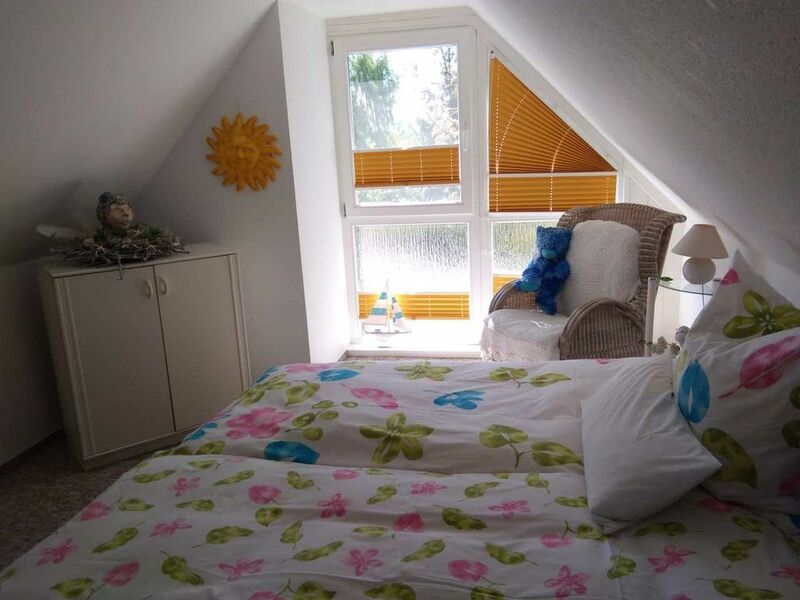 The spacious holiday home in Lubmin offers plenty of space on 2 floors. On the ground floor are the living room with a comfortable couch and TV, the bathroom with shower and toilet and the fully equipped kitchen. Upstairs, which can be reached via a steep staircase, is the bedroom with a double and a cot. The holiday home has a large, private garden, which is accessible by a separate driveway. In the garden you can sunbathe and escape the stresses of the day. Near the house is also a table tennis table. The house also has 2 terraces, one of which is oriented to the east and the other to the southwest. So it is possible both in the morning at breakfast and in the evening to enjoy the sun at the BBQ. Wir haben uns sehr willkommen gefühlt. Das Häuschen ist komplett liebevoll eingerichtet und ausgestattet. Es gab nichts, was wir vermissten. Der eingezäunte eigene Garten war toll für unseren Hund. Und der selbst gebackene Kuchen und die Eier der eigenen Hühner der Familie waren obendrein besonders schön, lecker und heimelig. Sehr familiär, freundlich und schön. Die Lage ist perfekt. Strand, Supermarkt und Kurverwaltung fußläufig erreichbar und dennoch ruhig am Ortsrand gelegen. Aus unserer Sicht uneingeschränkt empfehlenswert. Wir kommen wieder! Away from mass tourism lies on the Bay of Greifswald the Baltic Lumbin. The house is located on the outskirts, 800 m from the beach, in Lubmin. The village has 2 supermarkets, 1 sports center, restaurants, hairdresser, beauty service, pharmacy, doctor / dentist and a bus stop. Lubmin has become for locals and tourists a popular excursion and recreation. The adjacent pine forest and heath Lubminer determine the special atmosphere of the place and are particularly suitable for relaxing walks and hikes along the Baltic Coast. The coastline with its shallow water creates ideal conditions for families with children and is ideal for surfing and fishing. Two dog beaches also invite you to leave with a small animal. The 350m long pier and the beach promenade are favorites with visitors to the resort. You can enjoy nature! The maritime climate soothes and heals especially in chronic respiratory diseases and skin diseases. Particularly beautiful are the nightly sunsets that enchant one repeatedly. Excursions can be, for example, the Hanseatic city of Greifswald with its interesting old town just 20 km away or the island of Usedom, which counts since 1993 to the conservation area about 18 km away. Interesting is Germany's largest island, Rügen, where to back lot to see and experience value finds about 1 hour drive over Rügendamm or in summer directly by boat from Lubmin to Rügen possible.